The Rocket 44 speaker cables arrived today and so far I think I will be happy with them. They lose some of the midrange congestion that the AQ Slates had. The OML1's always sounded a little recessed in the midrange but not with the Rockets. The soundstage did not move forward but the midrange is as front and center, so to speak, as the rest of the range. Listening to Joshua Bell and Jeremy Denk's "French Impressions" I notice that Joshua's violin is more focused and detailed with the 44's compared to a larger blurry violin with the Slates. The Rockets also make it easier to follow the piano or violin since they sound to be a distance away from one another in the soundstage. Listening to Dwight Yoakam's "A Long Way Home" you certainly hear a very natural presentation of his voice. All the instruments also benefitted from the midrange clarity. Tonally they sound more like the AntiCables and less like the Slates. I do not remember the AntiCables having this much nuance to the sound but again for the money they are very good cables. The AntiCables beat the Slates as do the Rocket 44's. Now I know why the Slates ended up so quickly sold in bulk to retailers that would discount them heavily. Physically the 44's are not as bulky as the Slates. The AQ bananas are of high quality. So far they have made a great first impression but it will be weeks before I notice if any of today's improvements become tomorrow's annoyances. Oh and I like that they did not blow up my amp. Good luck but don't let them zip cord guys hear about this......coulda just used an old extension cord you had laying around. It should be okay since they know I am a crazy cable guy who can hear differences and all that stuff. Most of the cables I have owned were discontinued or discounted cables. The Alpha Cores were new from the manufacturer but since they did not work with either amp I think they were deffective and they went back. The Rocket 44's are the most I have spent on cables and there is an audible improvement. I do not plan on spending anymore money on cables but it is nice to get to this level of resolution and musicality. They also play well with the Micro Purl IC's. 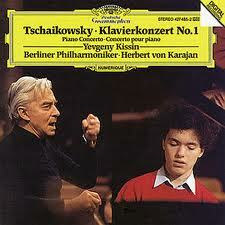 I just listened to a favorite old cd on Deutsche Grammophon of Tschaikowsky's "Klavierkonzert No. 1" with Yevgney Kissin on piano and conducted by Herbert von Karajan. In the past when listening to the Concerto for Piano and Orchestra I noticed that when the full orchestra was playing sometimes the piano would be lost. Tonight was the first time when the full orchestra was playing that the piano stood out and was easy to follow. Last edited by JohnMichael; 09-03-2012 at 05:47 AM. I just listened to a favorite old cd on Deutsche Grammophon of Tschaikowsky's "Klavierkonzert No. 1" with Yevgney Kissin on piano and conducted by Herbert von Karajan. . If you really like Tchaikovsky's 1st Piano Concerto (which I do), you owe it to yourself to purchase the BIS SACD of it with Yevgeny Sudbin playing the piano. You'll never listen to your Deutsche grammophon disc again! The disc has receive glowing international acclaim, and as it is an SACD and not a CD, it sounds terrific too. Hahaha nice one JM, I about spit up my drink when i read this! I just ordered it and it is on backorder but I will let you know what I think when I receive it. I love ArkivMusic it is so easy to sit and order classical music. A glass of wine in my hand and wearing boxers and a t-shirt. Sure beats going to a store. Oh and they had EMI classical reissues 5 for $20. Sweet! I have always liked the recording "Raising Sand" with Robert Plant and Alison Krauss but I questioned some aspects of the recording. In my system Alison's voice always seemed to be lower in level compared to Robert's voice. It was not the recording and with the Rocket 44's her voice is more prominent and so pure. Now I know what all the fuss is about over her. Mahler's Fifth is also sounding very good. Wide, deep, detailed and very musical in the good way. Lots of instrumental textures. Oh shut up, it was a joke and everyone but you got it. Well the disc arrived today. I have listened to it only once so far. I should have mentioned that the DG version was recorded live in front of an audience. I miss that passion from the disc you recommended. If you would like I would make you a copy of the DG disc. I have a stand alone cd recorder that makes exact copies so no reduction in sound quality. It is a nice recording but I prefer the other performance. It may grow on me as I replay it. The Rockets are easily the best cables I have owned. One initial impression was the improvement in the midrange and I must say I am still enjoying that improvement. In the past what first sounded like an improvement became a source of annoyance. The midrange is more detailed but never became forward or overbearing. Listening to one of the Trio cd's with Linda, Dolly and Emmylou this morning I was pleased by the ease of listening to individual voices during the harmonies. Dolly was sounding so sweet that I hated to leave the stereo and come to work. I think my cable search is over. I certainly do not plan on spending more for cables than what I spent for the Rocket 44's. The cables were $400 a pair but now I think I am hearing the best of the OML1's. I may get called out for this but I think the money was well spent on the cables because if I bought better speakers the performance would still be limited by the other cables. One day when I do upgrade my speakers I know the cables will not be the limiting factor. As I mentioned in the previous post I am hearing the best of the OML1's. I find I have lost interest in shopping for new speakers or building a kit. On the other hand I have no interest pulling out the MA RS6's to hear how they would sound. I think I need to sell the RS6's and much of my collection of cables. I have some stranded cables that would not be worth much. I am quoting myself because reading the quoted post I realized I am full of sh!t. My new 45 rpm record featuring acoustic bass and organ made me want to hear more bass. So out comes my pair of RS6's. Well I guess I was wrong about pulling out the RS6's and I was wrong about not thinking the 44's would improve the sound. The sound of the RS6's sound better but I will need to listen longer to see if I can enjoy them long term. I hope to have speakers that are not part of this routine of swapping every few weeks. Try as hard as I can not to do it but neither pair satisfies for the long term. The Rocket 44's are certainly working well with the RS6's. I was listening to Andreas Scholl's recording "Crystal Tears" and this combination allows me to easier follow his vocals. The extra midrange detail I first noticed with the OML1's is present also with the RS6's. Another cd that is more enjoyable is the Kronos Quartet's recording of Alfred Schnittke. In the past with other cables the music can sound cold. The individual tones of the instruments are more audible so the interplay on some pieces is easier to appreciate. The music has always had a sense of despair to me and still does but with a little more beauty and warmth. The young college women went home for the weekend so the place will be rockin'. The Rocket 44's are very smooth cables and were great with the MA RS6's and their metal drivers. My new JBLs are excelling with the AntiCables. Bright speakers or speakers with peaky treble can be helped by the Rocket 44's.